As we muse that this is what became of the Cold War, we might recall that it was on this date in 1904 (as the Library of Congress notes) that the first ice cream cone was served. On July 23, 1904, according to some accounts, Charles E. Menches conceived the idea of filling a pastry cone with two scoops of ice-cream and thereby invented the ice-cream cone. He is one of several claimants to that honor: Ernest Hamwi, Abe Doumar, Albert and Nick Kabbaz, Arnold Fornachou, and David Avayou all have been touted as the inventor(s) of the first edible cone. 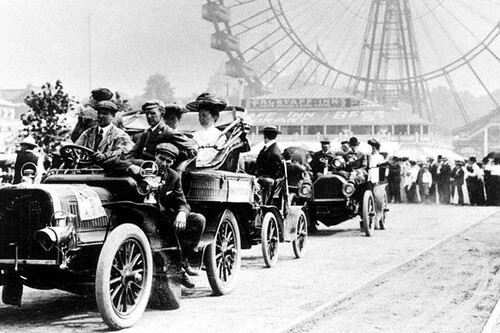 Interestingly, these individuals have in common the fact that they all made or sold confections at the 1904 Louisiana Purchase Exposition, known as the St. Louis World’s Fair. It is from the time of the Fair that the edible “cornucopia,” a cone made from a rolled waffle, vaulted into popularity in the United States. Another claimant, Italo Marchiony, actually received a patent in 1903 for a device to make edible cups with handles. However the patent drawings show the device as a molded container rather than the rolled waffle seen at the Fair. 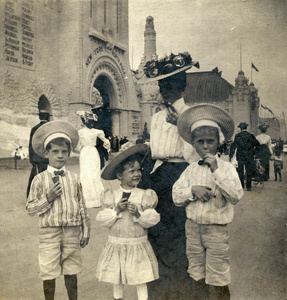 Although paper and metal cones were used by Europeans to hold ice cream and pita bread was used by Middle Easterners to hold sweets, the ice-cream cone seems to have come to America by way of “the Pike” (as the entertainment midway of the St. Louis World’s Fair was called).